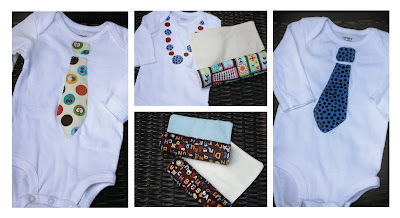 When I started crafting for my niece I started doing applique onesies in a number of different shapes using really fun, bright, girly patterns and colors! This time around my sister asked me to make some onsies for some friends that are having boys! So I had to try out these ties! I've seen them before but man are they cute...fun an easy to do to boot! I couldn't help but also throw one in for Ava with a necklace - her first piece of flair! I've also made some burp cloths in a fun dinosaur inspired cotton print with a solid fleece backing to give with these decked out onesies.